PORT OF MOBILE: Phase 3 development includes a 400-foot dock extension and super postpanamax crane rails. Port of Mobile Phase 3 expansion includes a dock extension and an additional 20 acres of improved yard. When completed, Port of Mobile project will accommodate annual throughput capacity of 650,000 TEU. Phase 3 is part of a plan to can grow the Port of Mobile’s annual throughput capacity to 1.5 million TEU. The Alabama State Port Authority (ASPA) and APM Terminals boards of directors in separate actions have approved a $49.5 million expansion of the container facility at the Port of Mobile. 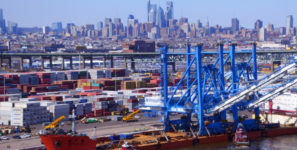 The Port Authority and APM Terminals jointly will deliver a Phase 3 expansion that includes a dock extension and an additional 20 acres of improved yard to maintain excess capacity to accommodate new business opportunities. When completed, the project will accommodate an annual throughput capacity of 650,000 TEU. The Phase 3 is part of a five-phase long-term plan that can grow the terminal’s annual throughput capacity to 1.5 million TEU. Under the Phase 3 development, a 400-foot dock extension, super postpanamax crane rails and upgrades to the fender system will accommodate 14,000-TEU ships. The 20-acre yard expansion ensures excess capacity at the terminal to accommodate new shipper and carrier business opportunities. The dock extension will take approximately 24 months to complete, while the yard will take 18 months to complete. When completed, Phase 3 will complement the recently completed Phase II investments that delivered 20 acres and installed two new super Post-Panamax cranes to accommodate new business through the terminal, including containers bound for Walmart’s 2.6 million square foot import distribution center at Mobile. The project will also complement the recently completed Intermodal Container Transfer Facility, which is accessible by five Class I railroads, including the Canadian National, CSX, Norfolk Southern, Kansas City Southern and BNSF. Currently, the Canadian National provides container intermodal rail service to key US mid-west and Canadian markets. “Container intermodal growth continues to drive investment at the Port of Mobile,” said James K. Lyons, chief executive of the Alabama State Port Authority. Since 2005, the Port Authority and its partners have invested $535 million in shore-side and channel improvements to support the larger container ships calling the Port of Mobile. “These prior investments have competitively positioned the Port and set Mobile as an alternate gateway for US trade. This expansion and our channel deepening and widening program will provide both shippers and carriers with a cost effective, customer service oriented option,” added Lyons. The US Army Corps of Engineers harbor modernization study is underway with a record of decision expected by the end of 2019. The Alabama State Port Authority owns and operates the State of Alabama’s public, deep-water port facilities at the Port of Mobile, currently ranked 10 largest US seaport by volume. The authority’s container, general cargo and bulk facilities have immediate access to two interstate systems, five Class 1 railroads, and nearly 15,000 miles of inland waterway connections. Yes! Finally someone writes about carlos.